I've always been intrigued by the discipline found in musicians. While their lifestyles carry similarities to the one I am used to of ballet dancers - perhaps found in the performing arts, but also in the unpredictability of the lifestyle - I've thought their methods of practicing to be quite unique. From my outsider perspective, I've always imagined they have to have an incredible amount of self-discipline, a little bit contrary to ballet where we're given a ballet teacher to push us every day. Musicians seem to require a lot of private time with their instruments, a lot of repetition, a lot of hours, and a lot of focus. But again, this is my idea of how it works, and I don't even really know how to play the recorder. So I've talked to two friends of mine who are musicians : Jean-Hee Lee, a Canadian violinist, and Nikolaj Henriques, a Danish bassoonist. I've asked each about how they practice, what they do and how they stay committed to it. "It's not so much self-discipline as it is panic," we both laugh, as well as Sam, who is with us eating ramen. Jean-Hee is quite well immersed with the world of ballet. Despite coining her own term for pirouettes as "twirly whirlies", she knows how we function, and perhaps it's because musicians and dancers have a symbiotic relationship, as goes with music and dance. We go into the fact that with ballet you have a daily class that enforces the training. Musicians don't necessarily have this. 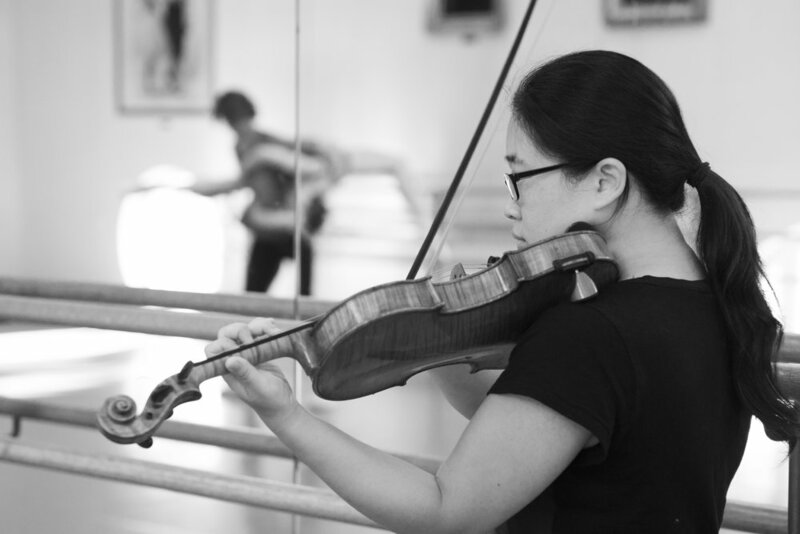 "Dancers always practice together, in a class environment, while musicians tend to practice alone, despite usually performing in a group that is an orchestra. When you practice by yourself, you do what you have to do and not what a teacher has to say." Jean-Hee tells me the importance of having a good teacher and how that can influence your success and growth as a musician. "But you have to take the training wheels off at some point," Jean-Hee says, "You can't always rely on the teacher." It's a fair point. There's often a transition from being the student to becoming a professional. As a ballet dancer, you always have your teacher at the front of class so you never really become free of that instruction. But perhaps that's where it's different as a musician, where you're required to become your own teacher eventually. "You have to be careful though, when you're on your own, because there is such a thing as 'bad practicing'," Jean-Hee warns as I urge her to explain, "It's when you're repeating things without being conscious of your errors. You try to go through it too quickly and you repeat that, but in the end you're wasting time because you're making the same mistakes over again. It's in the small movements that require finesse that need you to take it slow, so you can avoid the errors. "There's also a difference between practicing and playing. Ideally, you should be playing your instrument every day. There are tiny muscle movements that are involved in the mechanics of playing. Whereas practicing might not have to be as often." "Sometimes I practice in the dark. This strengthens my sense of hearing and feeling," she tells me, "It's a chamber group tactic. It's a good method to feel the group and be together as you play. "Then there is a distraction technique I use... if I ever have a problem or tension with, say, my left hand, I then put my focus on the right hand. "I also find it helpful to sing what I'm going to play," Jean-Hee laughs and modestly says she's got a terrible voice, "but it's a good way to achieve the note with your instrument if you can vocalize what you're aiming for." "As an insomniac teenager, I would often go through the music in my head while lying in bed," she explains, "And still now, I prefer this kind of mental practicing. I ask myself 'What are the notes? How do you do them?'. It's a lot about the visualization. Learning without the instrument." I find Jean-Hee's suggestion of visualization very intriguing. I'm taken back to little Emily injured at the age of 16. They forced me to sit and watch ballet class, which I thought would only make me more dismal about the situation of being injured. But what they told me to do was pretend I was doing the class inside my head. Learn the exercises and mentally execute them, and that it would help me get back into it more easily once my injury had healed. I introduce the topic of discussion similarly as I did with Jean-Hee. Nikolaj begins by stressing the value of having a good teacher who will teach you how to practice. "I like to use the metaphor of a beach, which is what my practice room turns into. You use the environment to build a sandcastle or dig a big hole. You might need a big shovel or a small shovel and it's important to have a teacher who provides you with the right shovel, the right tools. But it's also of importance for them to set you up so that you'll eventually be making your own tools and have your own ideas of problem solving." It's a very poetic metaphor that Nikolaj has created. Beaches are often peaceful places, and though the concept of practicing and doing work isn't usually considered relaxing, why not set the environment up in that fashion? I ask Nikolaj some questions about his personal practice routine. I ask how long he practices in a day and what his days are like. He tells me he doesn't have a specific number and he's not sure of many people that do but that he likes to create a structure. "I've tested it that I can only stay 100% focused for 17 minutes. After that I need a quick break, maybe only two minutes to check Facebook or play Angry Birds. Then I go back to practicing," I laugh, knowing all too well how easily it is to lose focus, being a person who can barely sit through a movie. "I think it's valuable to know when you lose focus and allow yourself to take that break so you can find that focus again." "In terms of the day's structure... take today," he continues, "I practiced for 3 hours, then needed a break, came to meet you, will probably go back and practice my musical concerto piece, then have dinner, and then maybe work a little more. This week has been mostly like this, but it will vary at different points, depending on performances and jobs. "When I lack a plan, I find myself getting stuck on the same note," Nikolaj says, "It can also be a beautiful thing, because then you get really good at that one note, but if you have too many things to work on in a day, it can be ineffective. I believe in a balance of quantity and quality, not one more than the other." In ballet, we often use the phrase of "being in shape". When you're not taking class or dancing regularly enough, you get out of shape. I ask Nikolaj what that would be like for musicians, both musically but also in a physical sense. "When you're working with the orchestra, you actually get into "orchestra shape". You become so used to playing in the group that you wouldn't be able to play a solo all of a sudden. "In terms of physical shape, it's important to have good posture and avoid any bodily tensions, so that your performance is done in an ergonomic way," he tells me, which I take as a personal note to sit up straighter, "I try to run and swim and do sports to build up my stamina, which I find makes it easier to play. But i can't let the exercise take away from the practicing. "Believe it or not, the first thing that gets tired when I play is my lips," we both laugh, "They're so big and a bit in the way, so they get tired before anything else." I move on to ask Nikolaj where his self-motivation comes from. It's evident with him, and Jean-Hee as well, that passion is a big part of it, but sometimes with discipline, you need more. "I've always been told to practice, since I started when I was 4 or 5," he thinks for a little bit, "I can't really say where it comes from. I guess that you have these expectations for yourself. You want to just become better. And I know that I'd be more stressed if I didn't practice. "It's hard to motivate yourself, when you consider packing up the instrument, going to the room, but then when I start to play, I forget that that lack of motivation was ever there," Nikolaj reveals, "It's also hard to find motivation when you think you're not doing well. I recall one of my teachers who told me there are two parts of the brain: one that tells you what you're capable of doing and the other that gives you your expectations. The two parts are in a race with each other and they surpass each other at different times. This is when it gets exciting." "One of the most important things for me to do is to pull things apart. I'll play and think of only one thing. Maybe only my fingers, maybe only the air, or only of the speed. "I have a small habit to move around unconsciously when I play, but then if it's a difficult part, I'll stand completely still," he tells me, "I tried an experiment by barricading myself with music stands so that I would stand completely still while playing." "I think the reason why I practice is to get to know my instrument so well, that I don't struggle to tell the story that I want to, while playing for an audience. " ** Thank you to Franz Siegert for the photo of Jean-Hee and to Nikolaj for this photo of himself.